Fast-growing internet world and mobile technologies have made the mobile apps, which we use in daily life often, an essential part of our lives. Moreover, the technological interest of the generation born in 1980 and in the end of 1990s and which is called “generation Y” has also played an important role in the popularization of the mobile apps. Read more about create an app to impress gen Z. Now, preferences of the generation Z, which born in the 2000s and after generation Y, leads the technology. Analyzing the interests, consumption habits and the view of the technology of this generation plays a great role in the success of the mobile apps. Here are some tips to impress generation Z. Generation Z which is different from previous generations in respect of focusing time can spare less time than other generations. Therefore, long or short downloading time, complex passes within the app or slow menus make easy for the generation to abandon the app. If you want an app that will impress generation Z, it will be better for you to take this kind of situations into consideration and make provision for these. Unlike generation Y that wants to be the attention point in social media platforms such as Facebook and Twitter, privacy is more important to generation Z. Therefore, apps that give the opportunity to their users to access with a nickname or anonymously are preferred by generation Z mostly. Generation Z does not like their online ID to be revealed, however, sometimes they prefer to share some sort of information with their social environment. Thus, giving the opportunity to share their ID with some users at any time may make them feel like they have the control. 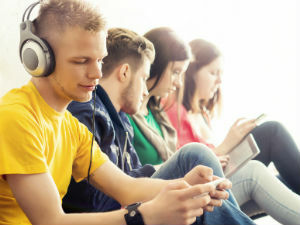 Impressing the generation Z that undoubtedly follows mobile technology world closely makes it easy to come forth in the rivalry. Create an app to impress gen Z. If you still do not have a mobile app, you can create your own mobile app via MobiRoller. Create your MobiRoller account now and meet with mobile users without wasting time.